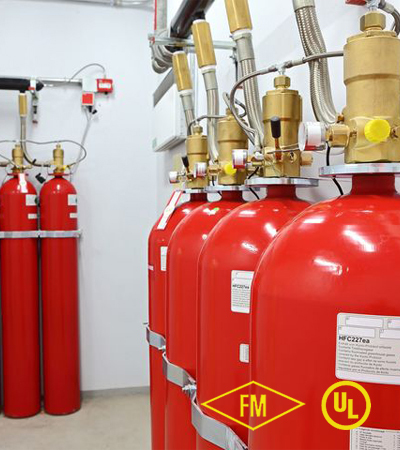 Our FM-200 Fire Suppression System is one of the best cost-effective solutions for fire prevention in highly sophisticated areas such as Data Centers, Vaults, Locker Rooms, etc. FM200 System is the best Halon 1301 replacement agent with zero ozone depletion potential (ODP) suitable for total flooding. Clean Agent HFC227ea System is an effective total flooding agent suitable for use on Class A surface burning fires, Class B flammable liquid fires and fires on electrical equipment. On a weight of agent basis FM200 System is a very effective gaseous extinguishing agent. The FM200 System extinguishing concentration for normal heptane (cup burner method) is approximately 5.8% by volume. The minimum design concentration for total flooding applications is 7% in accordance with NFPA 2001. Why Clean Agent HFC227ea System? No Post-discharge residue, no clean-up required. Low installation and maintance costs.